There are an absolute SHIPLOAD of video versions of the Scottish Play out there. Way too many to hit in depth. There are 15 immediately accessible ones that I’ve found, and I know that some of them are not going to be great (just the law of averages, baby). So how do I tell you about the really good ones without wasting my time (and yours) discussing the chaff? click to download the PDF of the bracket! 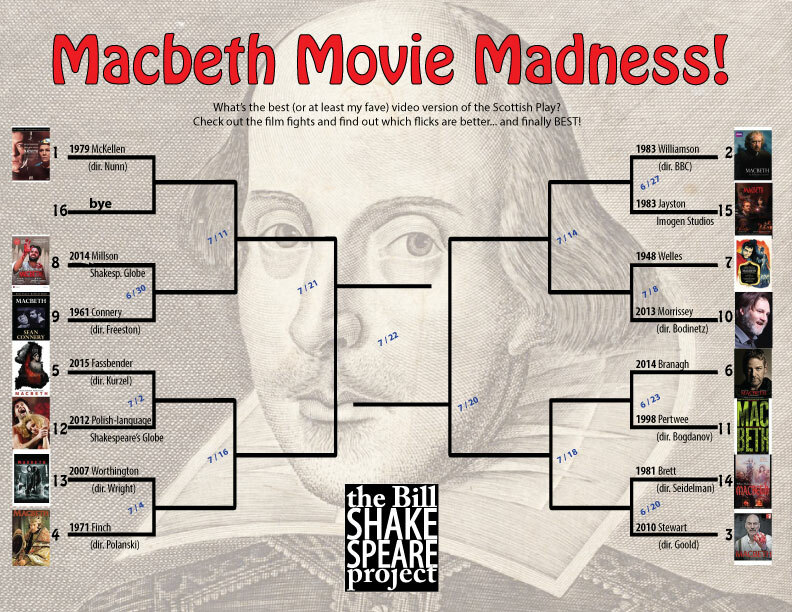 A tournament of those 15 video versions (I’m giving what is by reputation one of the greatest performances of the role of the twentieth century–Ian McKellen’s–a bye in the first round), in a seeded (by reputation and remembrance) bracket. On each of the days, I’ll briefly discuss the comparison of the two versions and name a winner, which will go on to the next round. Then, once we’ve crowned a champion, I’ll discuss the “elite eight” in depth in our video review podcast next month. We’ve got some interesting first-round macth-ups: the latest big-screen Mackers (with Michael Fassbender) goes up against a 2012 Polish-language version from GlobePlayer.tv … Michael Bogdanov, the director of one of the greatest stage captures I’ve ever seen (The War of the Roses from the early 1990’s…which sadly is no longer available on YouTube) goes up against the recently staged version by Kenneth Branagh. First up, a 3/14 match-up on Monday: Patrick Stewart from 2010 takes on Jeremy Brett from 1981. If you want to play (er, watch) along, the full-sized version of the above graphic and downloadable PDF will give you a preview of when we’ll discuss each pairing. And I’ll update that graphic after each “game” so you can keep track of your favorites and your hunches for bracket-busters.